Shri Brihaspati Kavacham has the power to fulfill all the wishes in life. One should listen or practice this kavacham for attaining education, knowledge, vastness, growth and expansion in life. 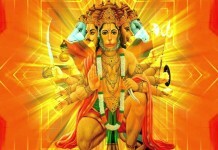 Guru or Jupiter, when not favorable in our horoscope then we may receive troubles by Guru. Hence this Brihaspati Kavacham is to be recited daily three times to be free from such troubles. 1 I bow to akshamaladhar and very silent Guru. Who gives whatever you wish. Guru knows everything. He is worshiped by gods. 2 Let My head be protected by Bruhaspati. Let my forehead be protected by Guru. Let my ears be protected by Guru of Gods. Let my eyes be protected by the giver of everything (i. e. Guru). 3 Let my tong be protected by the teacher of Gods. Let my nose be protected by Vedparagaha (i.e. having knowledge of Vedas). Let my mouth be protected by knower of everything. Let my throat be protected by Master of Gods. 4 Let my arms be protected by Vangirasa. Let my hands be protected by Shubhaprada (i.e. giver of good). Let my teats be protected by Vagisha (i.e. god of talk). Let my kukshi be protected by Shubhalakshana. 5 Let my naval be protected by Kevaguru. Let my middle part of the body be protected by Sukhaprada. Let my loins be protected by Jagtvandya (i.e. worshiped by all). Let my breast be protected by Vagpati. 6 Let my knees and thighs be protected by Suracharyaha. Let my feet be protected by Vishwatmakaha. Let other parts of my body be protected by Guru. We get everything we wish and become victorious by the grace of Brahaspati. Thus here completes this Bruhaspati kavacham which is from Brahamlaya. If Jupiter (Bruhaspati) is not favorable in the horoscope, then it is requested to recite this Bruhaspati Kavacham daily with concentration, devotion and faith in mind to make the life happy, peaceful and prosperous. Brihaspati called the Guru of other deities. Brihaspati called “Guru” (teacher) also. Brahaspati represents knowledge, wisdom and Satva guna. If Jupiter is not good and strong in birth chart, native may suffer from many problems, like over weight, lever problem, obstacles in work, disgrace in family and society. Native should chant prayers of him to reduce these effects. 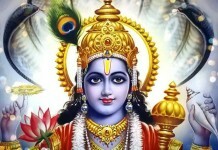 Brihaspati called lord of planet Jupiter. Brihaspati Kavcham (armour) prevents obstacles and sorrows. Recitation of Brahaspati Stotram and mantra in proper pronunciation may help to minimize evil effects of planets. 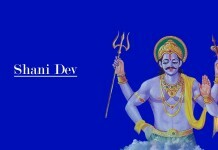 Guru is associated with Sapphire gemstone. Recitation of stotras and Kavch of Jupiter burn sin and sorrows.